This idea of receiving services influences our church selection process. 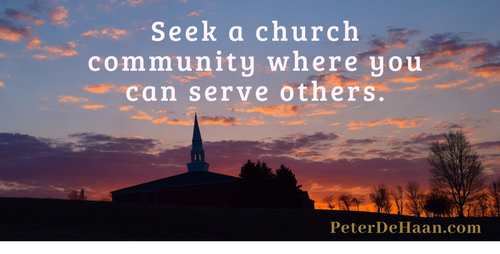 Seldom do people look for a church that gives them the opportunity to serve. Instead they look for a church for the benefits it provides: the music, the message, and the ministries. They’re church shoppers, pursuing church selection with a consumer mindset. The result is a retail religion. These folks shop for a church the same way they buy a car or look for a gym. They make a list—either literally or figuratively—of the things their new car, gym, or church must have. Then they make their wish list of what they hope their new car, gym, or church could have. And then they make a final list of deal breakers, detailing the things their new car, gym, or church can’t have. They tick off items on their list. With intention they test drive cars, check out gyms, or visit churches. In each case, they immediately reject some and consider others as possibilities. Eventually they grow tired of shopping and make their selection from the top contenders, seeking a solution that provides them with the most value. A better, and more God-honoring approach, is to seek a church community that provides opportunities for us to serve. We need to stop thinking of church for the things it will provide for us and instead consider the things we can do for it, that is, for the people who go there and the community surrounding it. Service is not an isolated activity. As we serve, we do so in community. Church service and community matter more than church programs and benefits. Retail religion is out, and church community and service are in.